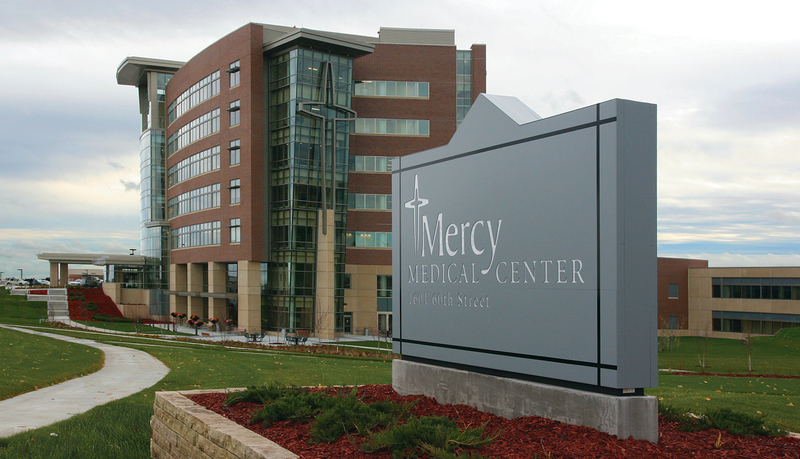 Mercy Medical Center – West Lakes is the first LEED® certified hospital in the state of Iowa. The 239,000-sq. 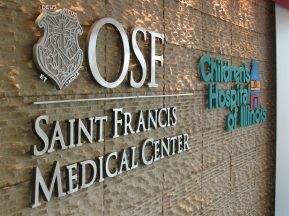 ft. 7-story building combines a healing focused interior design with architectural features and functions intended to minimize the hospital’s impact on the environment. Large windows help bring natural light into the hospital, which clinical studies show promotes healing, also helps lower energy costs. Special sensors turn off lights in areas when they’re not needed and a special water flow technology cuts water usage by 21%. The West Lakes facility is the second phase of a master-planned medical campus. 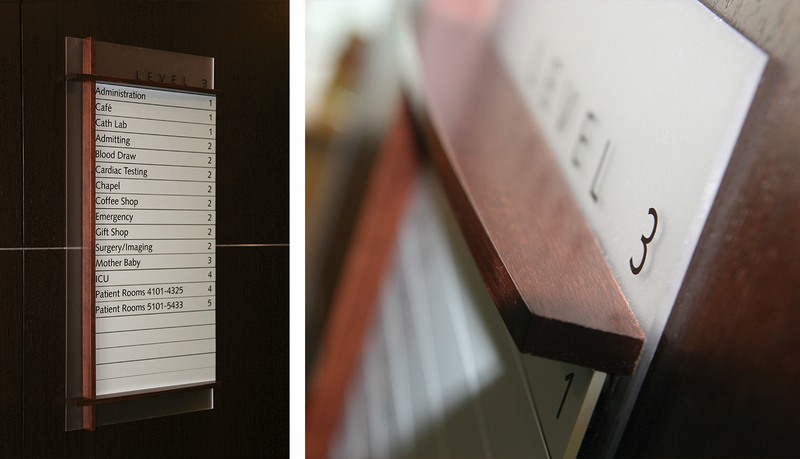 Because ASI successfully designed and implemented a complete signage solution the East Tower, known as Mercy Medical Center, the hospital management asked ASI to create a solution for the West Lake facility. 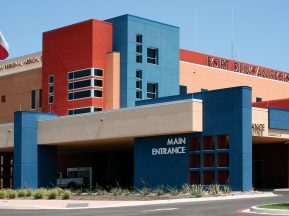 The signage design had to work in concert with the healing focus environment and complement both the new architectural design while still looking like it was an extension of the East Tower signage solution, located across town. 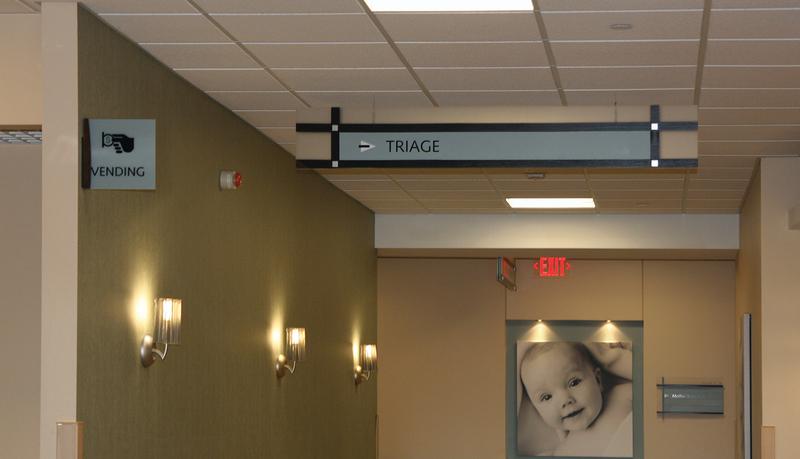 In addition to design challenges, the wayfinding solution for the interior signage had to effectively guide and transition patients and staff as they traveled back and forth between the medical office building and the new West Lakes facility. After surveying the site and determining the placement and messaging for both the interior and exterior solution, ASI began the design process. Building upon the designs from the east tower, ASI developed a color palette and material solution that helped reinforce the healing focus environment and complemented the architectural features. 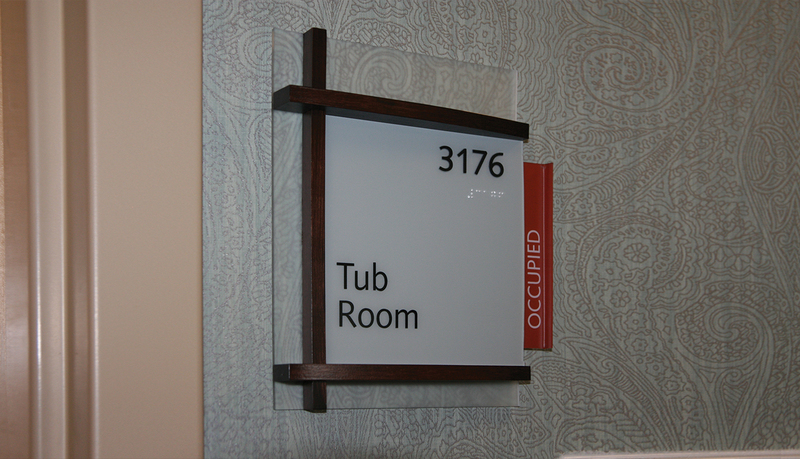 The custom interior solution is built on a frosted acrylic base with solid wood accent bars forming a perpendicular grid. 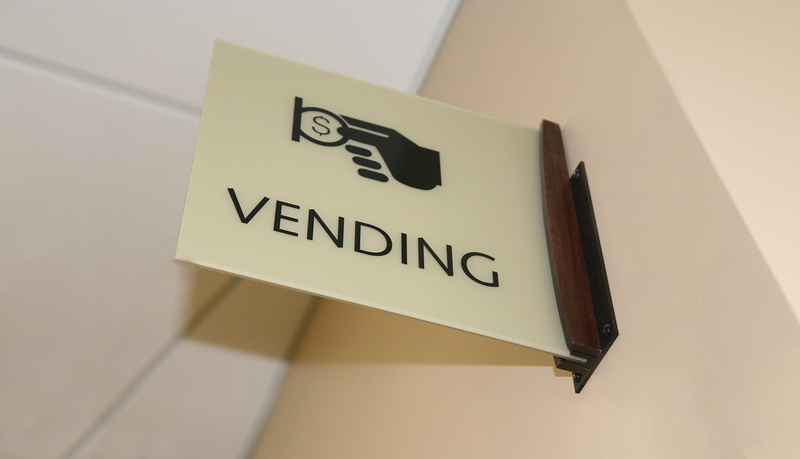 To make the solution modular, ASI integrated its Infinity™ sign system which allows easy updates to graphic and ADA panels if departments move in the future. 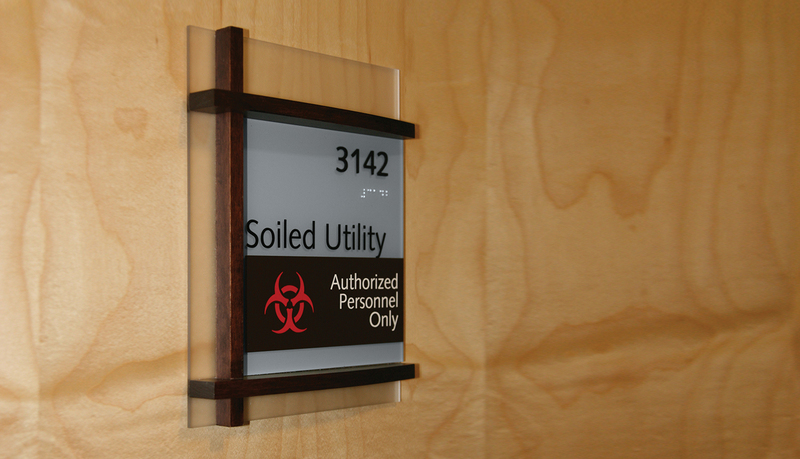 The complete interior solution includes patient room signs, department and office signs, overhead directional signs, projecting signs, and regulatory signs. 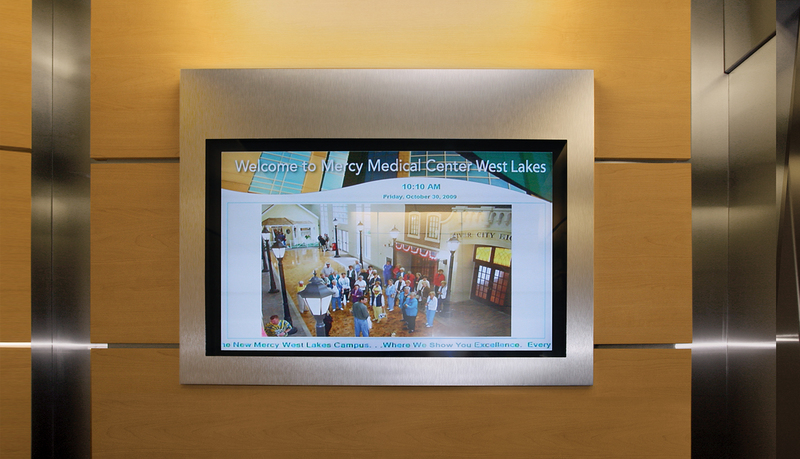 ASI also designed and installed dynamic digital information boards inside the elevators and the lobby areas to help keep patients staff informed about current services offered by Mercy Medical Center. 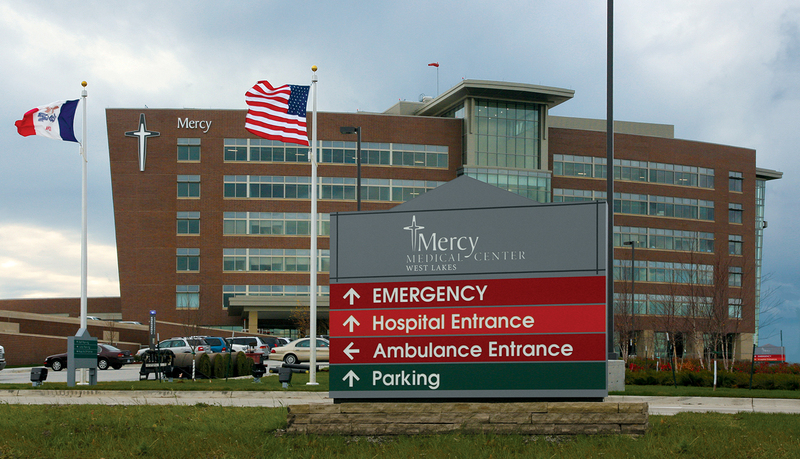 The custom exterior solution integrates the Mercy brand identity, effectively guides patients to the right place, and begins to integrate the interior design theme with surface applied black vinyl accent lines to form a grid. 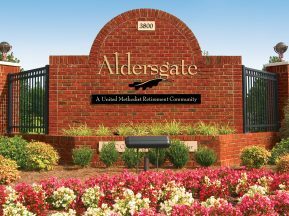 The complete system includes internally illuminated monument signs, directional signs, and post and panel directional signs. 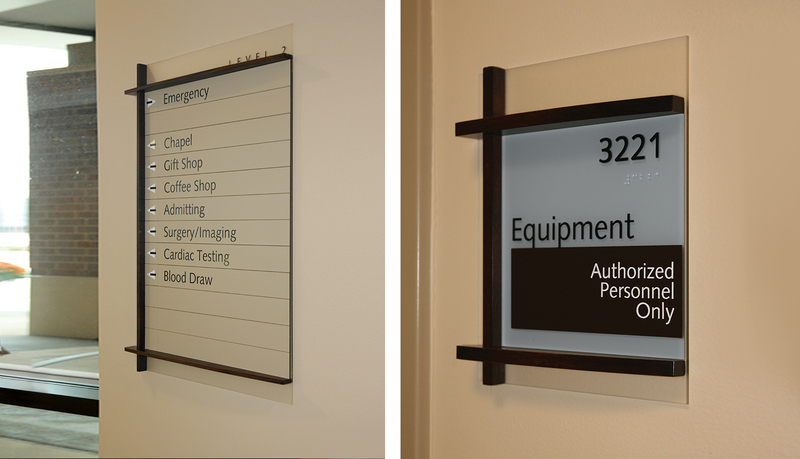 Each exterior sign carries through a wayfinding color scheme to ensure patient looking for parking can follow the green panel messages while visitors needing emergency services can follow the red panel messages. 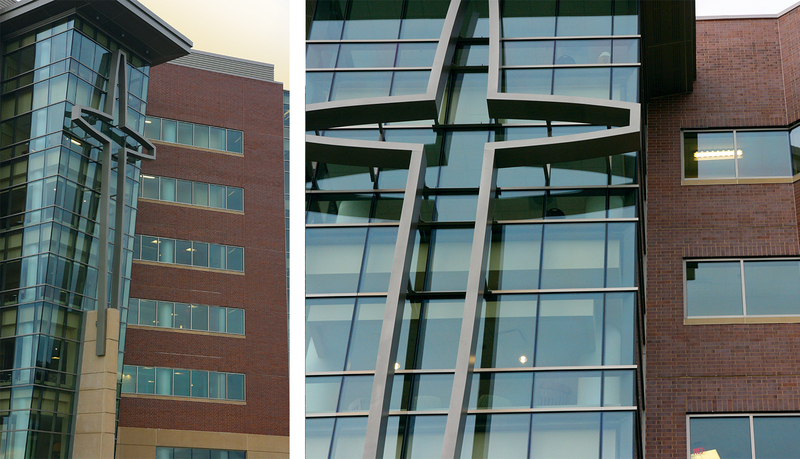 For the massive 5-story Mercy cross logo on the glass façade and the wall-mounted letters and logo, ASI worked with its system of alliance partners to intelligently and effectively produce a solution that pleased everyone involved, including the hospital’s CEO and the contractor. 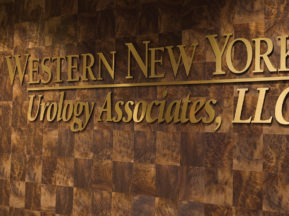 The materials and finishes required for all the exterior signage had to be able to withstand extreme weather conditions of the Midwest region. In addition, the 5-story cross posed several engineering and installation challenges, which ASI overcame by combining the resources of its team of solution partners.